To the martial music of her own brass band, Edgartown staged a parade in celebration of the Fourth and in honor of her veterans of the World war, which must have convinced these forty-five youths and men that they still stand ace-high in the estimation of their fellow townsmen. For Edgartown does not forget and she proved that memorable fact in a memorable fashion. If some one presented you first with a gorgeous silken flag, then with a proprietary interest in a brand new monument bearing on one side a bronze tablet with your name inscribed that he who passed might read, then with a medal of your very own, not mentioning complimentary remarks in every speech that was made during the day, and saying nothing about the cheers and hand claps that greeted your coming, wouldn’t you feel that almost everything any body could do to present you with a perfect day had been done - wouldn’t you? That’s what Edgartown did. And it was the veterans of another war, not a World war, but a war that divided house against house that pitted brother against brother in the battle line, who did their utmost to make the Fourth of July in Edgartown worth remembering. The Woman’s Auxiliary of the American Legion, responsible for the tablet whose unveiling was the most dramatic scene in the celebration, had a lot to do with it. All the organization which entered floats, and all the people who marched, and all the townspeople and summer visitors who watched and cheered, and all the little boys who shot off fire crackers under the very noses of the former members of the A.E.F. to make sure that they wouldn’t grow gunshy, deserved credit, and plenty of it. But when you consider that Edgartown boasts only five living members of the Grand Army of the Republic, that one of these, George W. Pease, was unable to leave his home and that the other four were in line, you’ll admit that their record stands at one hundred percent. Beriah T. Hillman, in a faded blue uniform with a dashing red sash wound around his waist, was master of ceremonies. He was also marshal of the parade assisted by Frederick W. Guild and he performed his duties with an energy and spirit which set the pace for the whole celebration. In the quaint costume he wore when he served as drummer boy with the Union army, Richard G. Shute, wielded his baton with authority and success, and led the band on to musical victory. Rev. Irving Coombs and Alonzo D. Fisher were conspicuous figures on the float entered by the Relief Corps. Promptly at ten-thirty, the forces assembled at the park, got under way. It was an ideal day for marching, for anything in fact. The sun was so hot that there was no doubt at all about its being summer, but the breeze was so cool that no one cared if it was. The town looked peculiarly festive for the occasion, decorated all along the line of march not only with flags but with sweet scented flowers of the more delicate tints. Just as they were ready to swing down Main street, the parade halted for a moment, the members of the A.E.F. stood at attention to receive the gift of glorious deep blue lettered in gold with the name of the Edgartown chapter of the American Legion. It shared the honors with the Stars and Stripes throughout the parade. The line of march led down Main street to Water street, up North Water street to Morse, Morse to North Summer, North Summer to Water, South Water to Davis Lane, Davis Lane to Peases Point Way and to the monument erected at the triangle where Main street and the Way cross. Still playing as valiantly as ever - for the Edgartown band stops to breathe only when it is absolutely necessary - the musicians kept every one happy until the whole throng was massed close about the monument. Its side facing Main street was covered with the town’s service flag, concealing the tablet. Rev. Earnest A. Royal offered an appropriate prayer. As the band played the Stars and Stripes, Captain George W. Brown hoisted a brand new flag to the top of the pole surmounting the concrete monument. Mrs. B. S. Beetle made a speech of presentation for the tablet. “Mr. Wimpenny, on behalf of the Bronze Tablet Committee I present the Memorial to you as Chairman of the Board of Selectmen of Edgartown. As we look upon it, now, so near completion, it should be remembered that it has grown from the small beginning of a little over a year ago. Then was conceived the idea of placing somewhere in our town an Honor Roll of some enduring material, bearing the names of our soldiers and sailors who were away from their homes for so many long weary months of the war. “It was to have been a very simple bronze tablet, but as a suitable location was hard to find, matters were at a standstill for some little time. Then there appeared in the columns of The Gazette an item in which someone was interested and thoughtful enough to suggest using the present location and making of it a public square. This was a much more ambitious project than anything we had dared hope for, but with the hearty support of the towns people and the generous gifts from our many summer friends, it has been carried through successfully. Our largest gift in money was received only a few days ago, $100 from Mr. Bancroft Davis. There are many to thank and we wish it were possible to say a word to each one who has helped in any way. But a few deserve particular mention. First for the idea itself we are grateful to Mrs. Arthur Weston; then to Mr. Albert Fernald we again extend our thanks for his carefully drawn design and working plans. The flag is from Miss Ethelinda Mayhew and is one of our most cherished gifts. We cannot forget Mr. Julien Vose with his practical suggestions and careful attention to many business details. And now just a word of acknowledgment for the conscientious canvassing of the town by the committee of solicitors. Indeed, we thank you all for the way in which you have responded. Without the help of each and everyone of you this Memorial would not have been possible. And I think that you will agree with me that we have reason to be proud of our Honor Roll with its forty-five names. Mrs. Chairman and members of the Woman’s Auxiliary of the American Legion: As a member of the board of selectmen of Edgartown, for and in behalf of the inhabitants of Edgartown, I accept this tablet, placed here in honor of the soldier and sailor boys of Edgartown who served in the Wold’s war, and I thank you of the auxiliary, and all others who contributed in any way toward the procuring of this tablet. We should be glad that we can meet here today with no sorrow in our hearts, but with thanks to a kind Providence that watched over our boys and returned them safely to us again. The shot from a pistol in Serbia was the starting of the World’s War. All of Europe was aroused, while we of the United States watched at first with curiosity, then with interest, then with concern. After an unwarranted delay, after American lives had been sacrificed, with little or no demand for reparation, we finally entered the war to save ourselves, and in saving ourselves we saved the world. The boys of Edgartown responded to the call, as they have done in every war the United States has been engaged in. The sons and daughters of Edgartown have always responded to the call of duty, and Edgartown has more than filled her quota, and in raising money she has “gone over the top.” Boys of the Army and Navy - you may well feel proud that your names appear on this tablet, and also have the satisfaction that you did your duty as American citizens in helping uphold the dignity and honor of the United States, and the respect for the Stars and Stripes, the flag that never knew defeat. The hoisting of the flag today carries me back to the year 1861. I was then a young boy. A liberty pole had been erected in front of the town hall, and after the exercises appropriate to the occasion the Stars and Stripes were hoisted by a ship-master, Captain Jared Fisher whom many of you may remember. And how befitting it is that this flag today should be hoisted by a ship-master, for they have hoisted that flag in many a foreign port and have seen and know how it is respected by other countries. Louise Thelma Waters, small daughter of Mr. and Mrs. C. F. Waters, Jr., who with Julien Vose Weston was supposed to unveil the tablet, lacked the necessary courage at the last moment, when she found herself surrounded by so many strange faces and so far from her mother’s arms. But although some one else pulled the string which released the flag, she remained on the scene of action to the end and made a charming picture in her dainty white dress and tri-colored hat. After the unveiling, the marchers made their final stand on the courthouse lawn, where occurred the presentation of the medals. The members of the A.E.F. were lined up facing the courthouse during the speech which preceded it, stepping forward as their names were called by Mr. Hillman. County Commissioner Francis A. Foster pined the medals in their uniforms. C. Lawrence Barry, until recently a captain in the marine corps, made a short speech before the presentation. Captain Barry, who married a daughter of John B. Worth, is well known on the island, having visited here when Massachusetts was looking over her military resources in 1917, and later serving as a member of the draft board. He paid high tribute to the Edgartown men who heeded the call to arms, remarking that they displayed the same willingness for service that always characterizes both youth and age in America. Admittedly they went through hell, said the speaker, but, gloriously, throughout it all, they remained gentlemen, performing their given duty with honor. Never, he said can they live down the reputation they made abroad, always rather, must they live up to it. He warned them of the danger ahead during the next ten years, when the spirit of true Americanism must fight and win. As her men were willing, so were her women resigned to the sacrifice said Mr. Barry, who “saw souls laid bare” during the days of the draft. He said that he can never see a woman with a service pin now without taking off his hat in holy reverence, and he exhorted his hearers to remember and keep holy the memory of the sacrifice made by the women of Edgartown. All through the ceremonies the audience remained attentive and interested, breaking up at last with the singing of America, and three long cheers for the flag. The Woman’s Auxiliary marshaled a large force of marchers, who came directly behind the A.E.F. The were dressed in white and carried American flags. Next came the floats, led by a small automobile completely disguised in bunting and carrying Fred Chirgwin dressed as Uncle Sam, Louise Thelma Waters and Julien Vose Weston. Other floats included the Relief Corps - an old farm wagon drawn by an antiquated horse bedecked with tiny American flags, Rev. Irving Coombs, in a high silk hat and imposing black suit of the style of the sixties, and Alonzo D. Fisher in his Civil war uniform, occupied the front seat. Back of them sat Mrs. Julia A. Norton and Mrs. Coombs, appropriately costumed in the quaint dress of that day. They carried a banner, which read “In the year 1862, Edgartown sent 80 volunteers who helped save the flag,” and on the other side, “What rations did they get? Hardtack and beans. All the fun they had was dodging the enemies’ bullets.” Mr. Coombs remarked that his last taste of hardtack was with Hardtack Battery at Camp Misery. The D.A.R. - In the charming colonial costume, Mrs. Leroy Vose, Miss Isabel Wimpenny and Miss Rita Thaxter, were kept busy with their knitting. In the center of the float was a large spinning wheel. Mr. Edgar Strong, also in colonial costume, drove the pair of sturdy gray horses. The Woman’s club - In the centre of the float, rose a replica of famous liberty pole of Manter Hill, the story of which with the part played by Polly Daggett, Parnell Manter and Maria Allen, was written by the late Malda Fairbrother and recently printed in the Gazette. Mrs. R. L. Colter, Esther and Irene Chadwick rode on this float. Degree of Pocahontas - a float decorated with pine boughs and daises and filled with squaws and papooses, who turned out to be little Helen Shurtleff and Albert Prada, Mrs. Jennie Prada, Mrs. Jessie Shurtleff, vice president of the organization, Mrs. Ernest Royal, Andrew Averill. A collie, Duke, was also in company. Improved Order of Redmen - float representing the meeting of John Pease with the Indians, from whom he purchased the island of Martha’s Vineyard. The costume of the Puritan and the Indian formed an effective contrast, J. 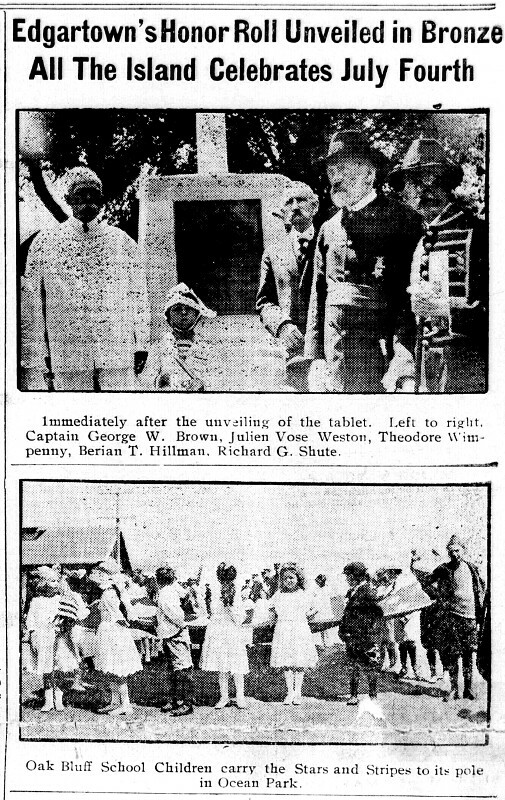 B. Worden rode on horseback, and those on the float were George Geddis, Everett C. Fisher, W. H. Fisher, Joe Bettencourt, Frank L. Norton and Antone Prada, Jr.
Woman’s Auxiliary of Legion - float representing baby’s prayer, with Miss Constance Beetle and Masters Malcolm Kenniston and Richard Beetle. Members of Red Cross. American Legion - Recruiting station, with Henry L. Ripley. The Carol club - float representing old-fashioned singing school. Riding in front were Mrs. M. G. Burke, founder of the club; Master John Osborn and W. C. Gallipo, who served in the motor transport corps. The children included Henrietta Osborn, Mary Santos, Irene Hall, Ruth Nevin, Sophia Terra, Deidamia Osborn, Rosamond Gordon, Irene Andrade, Lillian Santos, Ruth Royal, Esther Ripley, Katherine Perry, Carrie Osborn, Margaret Teller, and their teacher, Viola Currier. Army: Antone B. Andrade, Jr.. A.E.F. ; Joseph Andrade, A.E.F. ; John H. Bachelder; Frank R. Brown, A.E.F. ; Leon W. Brown, A.E.F. ; Edwin Coffin, A.E.F. ; Irving H. Coffin, A.E.F. ; Elmer H. DeLoura, A.E.F. ; Herbert N. Duvay, A.E.F. ; James W. Eldridge; Jesse H. Jeffries, A.E.F. ; John H. King; Richard H. Morton, A.E.F. ; Alfred E. Richard; Norman C. Royal; Frank Salvadore, A.E.F. ; William E. Salvadore, A.E.F. ; Luther M. Sibley; Edward F. Silva, A.E.F. ; Charles A. Teller, A.E.F. ; William H. Ward, A.E.F. ; Clarence H. Waters; Grames P. Waters; Arthur D. Weston, A.E.F. Navy: Joseph S. Bettencourtl Manuel Bettencourt; Maurice E. Brown; Anton F. DeFrates, A.E.F. ; Freeman O. Downie; John F. Enos; Walter P. Hillman, A.E.F. ; Carl W. Huckins, A.E.F. ; Earl C. Laidlaw; Harry Mullineaux; Thomas K. Neilson, A.E.F. ; Samuel R. Norton; John O’Neill, Phillip Perry; Joseph S. Rose, Jr., A.E.F. ; Edward K. Sulvia, A.E.F.l Charles F. Waters, Jr.; Thomas J. Wilson. Merchant marine: George W. Brown; Henry A Kelly; Percy D. West, A.E.F.